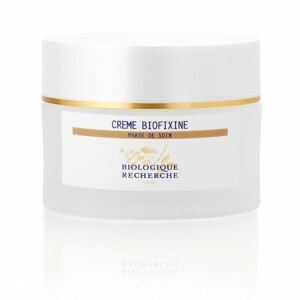 Crème Biofixine will help to reduce the appearance of fine lines and wrinkles, improve skin elasticity and prevent the visible signs of ageing. Anti-wrinkle agents of walnut extract and green anise will help to smooth, edelweiss to fight free radicals and grape seed oil to moisturise the skin. Studies have shown a 20% reduction on forehead lines and 22% on smile lines. This cream could be used by all but is better suited to devitalised Skin Instants® concerned with fine lines and wrinkles. A powerful youth enhancing cream. Moisturising agent: Grape Seed Oil.